There are considerations beyond those discussed above that may be used in determining the type of pavement appropriate for a given situation. It is important to review these in order to develop a holistic justification for pavement type selection decisions. 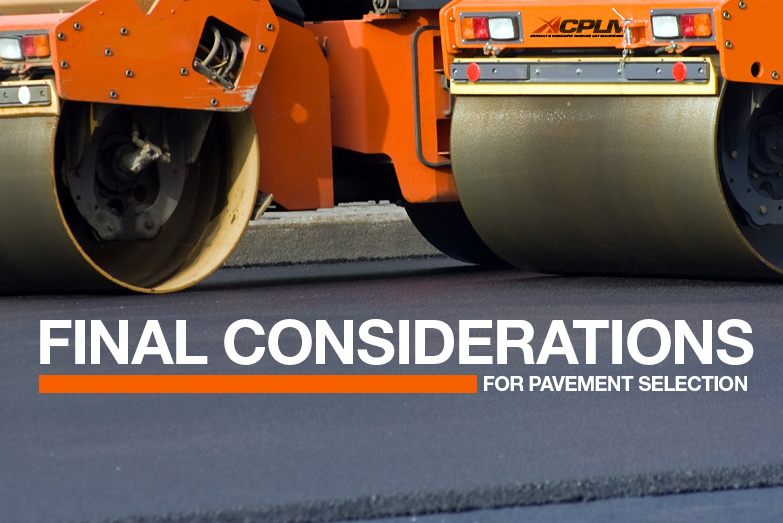 It is becoming increasingly important to consider the environmental and economic impacts of pavement type selection and construction both now and in the future. Many of the practices used in the construction of asphalt pavements over the last few decades are recognized as sustainable. It has been common practice to incorporate recycled materials in asphalt mixtures since the late 1970s. Recycling has important implications on the consumption of raw materials and the processing it takes to incorporate them into the pavement. By reusing the asphalt binder in the RAP, it is possible to consume less virgin binder, which conserves petroleum. The reuse of aggregate allows for less mining. Currently, there are about 18 billion tons of asphalt mixtures in place on U.S. roadways. Virtually all of this material is available for future generations to use. Furthermore, waste materials from other industries such as waste shingles, slag, foundry sand, and tire rubber can all be beneficially incorporated into asphalt mixtures. The speed of construction and flexibility in timing rehabilitation also contributes to an improved environment. Because roadway work on asphalt pavements is frequently accomplished during off- peak traffic hours, it is possible to significantly reduce congestion and reduce the accompanying vehicle emissions. The construction of Perpetual Pavements is a very sustainable practice because the design is such that the overall structure remains intact with only infrequent resurfacing required. This reduces the materials consumed over the long term and results in a low life-cycle cost. Asphalt pavements have a low carbon footprint compared to other pavement types. While a certain amount of atmospheric carbon is generated in the production of raw materials and mix production, it is far lower than the amount generated in the production of portland cement concrete when one considers the amount of carbon dioxide released in the manufacturing of the cement. The carbon contained in the asphalt binder is also bound in the product rather than being released to the atmosphere through burning. Noise generation can be considered on high- speed roadways. At speeds over 50 mph, the predominant traffic noise comes from tire- pavement interaction. Using a low-noise surface reduces traffic noise at the source. Studies have shown that dense-graded asphalt mixtures can reduce the noise level by 2 to 3 dBA compared to concrete pavements. A reduction of 3 dBA from 76 to 73 has the same effect as either reducing the traffic by half or doubling the distance from the source of the noise (Wayson,1998). A noise reduction of up to 5 dBA can be obtained by using an SMA surface, and a reduction of up to 9 dBA can be obtained by using an open-graded friction course (Wayson,1998). Asphalt pavements are generally very smooth upon construction. If they are properly designed structurally, they maintain their smoothness better than if they are under-designed. Asphalt pavements are built in lifts instead of all in one layer like concrete pavements. Each lift provides the opportunity to obtain a better ride quality in the final product. Thus, it is easier to obtain a smooth pavement with asphalt. Furthermore, an FHWA study (Perera et al.,1997) of the data from the Long-Term Pavement Performance Program shows that asphalt overlays provide excellent smoothness, regardless of the pavement roughness prior to rehabilitation. Data from the WesTrack experiment (FHWA, 2000) show that smoother pavements can save highway users fuel and maintenance costs. It was noted that after rehabilitation of rough pavement sections, fuel costs for the trucks used in this field study decreased 4.5 percent and the number of vehicle fatigue failures decreased drastically. Each time a new asphalt surface is applied to an existing pavement, an opportunity presents itself to renew the friction and water-handling characteristics of the roadway. The use of hard, durable aggregates, combined with technology designed to reduce rutting and consequently reduce hydroplaning, will enhance the skid resistance of the pavement. Furthermore, if a new generation open-graded friction course is applied to the surface, not only are the skid resistance and rutting resistance improved, but the amount of splash and spray during rainstorms is also reduced, which improves driver visibility. Delineation of lanes and pavement markings is enhanced with asphalt pavements.